Dr. Leighton was very friendly, took her time during the appointment . The office didn’t accept any of the online formsthat were completed, so be prepared to fill out everything again. It also didn’t seem like they were aware of the online appointment, as I called the morning of to confirm and they took awhile to find my appointment in their systems. Dr. Leighton was very friendly, took her time during the appointment . The office didn’t accept any of the online forms that were completed, so be prepared to fill out everythingagain. It also didn’t seem like they were aware of the online appointment, as I called the morning of to confirm and they took awhile to find my appointment in their systems. Love doctor leighton. She's very thorough and so sweet. Makes you feel very comfortable and really wants to get to knowyou as a patient. I felt like she treated me like she would her own family. I would highly recommend her and her office staff are very nice and efficient. Love doctor leighton. She's very thorough and so sweet. Makes you feel very comfortable and really wants to get to know you as a patient. I felt like she treated melike she would her own family. I would highly recommend her and her office staff are very nice and efficient. Harmony Leighton is an accomplished and reliable internist and cardiologist serving the community of Edison, NJ. Dr. Leighton attended the New York Institute of Technology, New York College of Osteopathic Medicine, where she received her medical degree. She completed her residency in Internal Medicine and fellowship in Cardiology at New York-Presbyterian/Queens. She also holds a bachelor’s degree from Binghamton University. Dr. Leighton is a part of Cardio Medical Group. She is board certified by the Certification Board of Nuclear Cardiology, the National Board of Echocardiography, and the American Board of Internal Medicine in both Internal Medicine and Cardiovascular Disease. She is affiliated with the JFK Medical Center in Edison, NJ. As the office has staff fluent in both Spanish and Russian, patients from a variety of backgrounds enjoy having her as their physician. She is a member of the American College of Cardiology, the American College of Physicians and the American Society of Echocardiography. 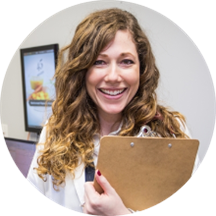 Dr. Leighton is uncompromising in her dedication to the well-being of her patients. She is committed to giving the best care and establishing long-lasting relationships with them. The office is very busy, but Dr Leighton is very personable making my visit experience a pleasure. Really nice. I don't have insurance and they seemed to be sure I only got done what I needed to avoid extra costs.